We hauled home a huge pineapple. Two days back. You could say it was love at first sight, my husband fished it out from a big pile and insisted that we need that portly one even though there is just the two of us. There are times when it's easier to give in to my husband, rather than argue in the middle of a busy supermarket fruit section. This was one of those times. Fine so the pineapple comes home with us. Husband was full of plans, grilling pineapple chunks, making a chutney with it, putting it in cheeseboard....then today morning he wanted some for breakfast and trust a man to slice that huge pineapple all at one go. There was enough fruit to feed a mini army and on top of that there was a melon and some peaches and bananas. Rest of the fruits we made a quick fruit salad but the pineapple turned out really sour. I mean really, really sour. So sour that one tentative bite and I got a kick much stronger than any coffee can give me. Not a pleasant experience at seven in the morning. There was no way we could have put it in the fruit salad without loads of sweetener So I decided to make pineapple juice. But rather than adding copious amounts of sugar to sweeten the juice I decided to spice it up. I must say I deserve a pat on my back for this brilliant idea. The juice tasted awesome and it was healthy to boot. But this is no novel idea. Juice stalls all over India serve fresh fruit juice either with sugar or spices or with neither as specified by the customers. I just borrowed that idea. 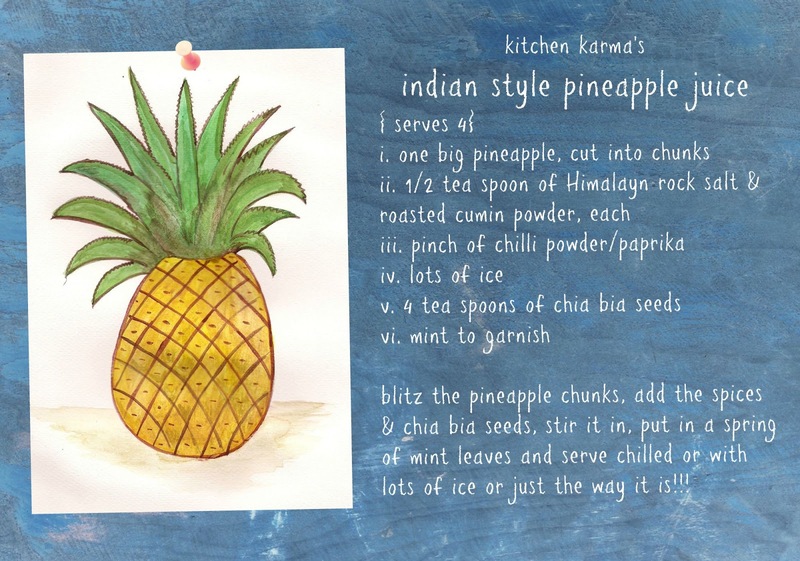 Here is how I made my Indian style pineapple juice. 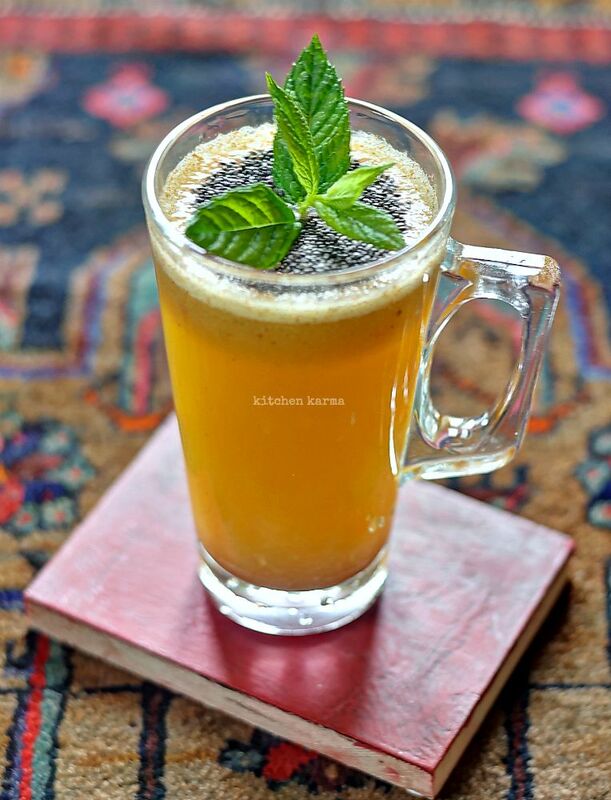 Because of the additional of the Himalayan rock salt, the roasted cumin powder and the red chilli powder, this juice becomes pretty spicy and tastes rather exotic. Give it a try and you will be pleasantly surprised. The same spices are used to make the Indian chaats, so this juice tastes very much like Indian street food, which is so much fun than just boring old juice. The addition of the chia bia seeds is because of the challenge I am doing currently. 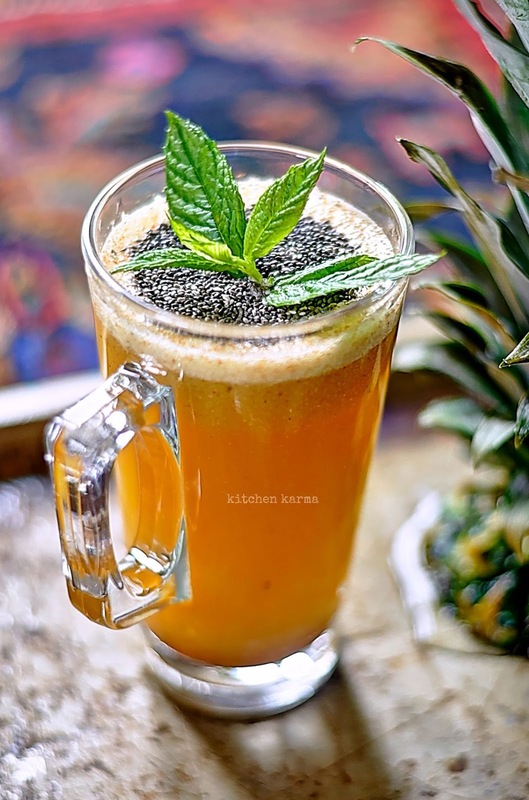 The idea is that I will incorporate two tea spoons of chia bia seeds in my diet every day for two weeks. These tiny seeds are super food and are supposed to do good to my body and make me feel energetic. I am basically fond of all kinds of nuts & seeds. So I am enjoying these chia seeds as well. They add a bit of crunch to the juice and I enjoyed that. Loving all the flavors in it, and the beautiful color..looks so good..
A Trip to Scotney Castle!